One of our biggest fears as we age is falling, yet rarely do we spend time with our active agers addressing our feet which carry us through life. 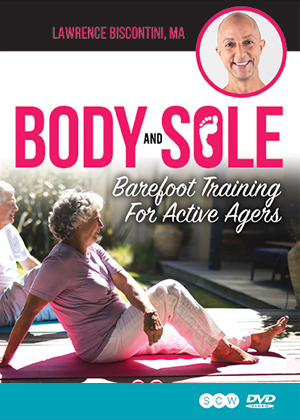 Research and Review from the Barefoot Trend is hotter than ever, and this workshop fuses the latest peer reviewed, cutting-edge information with practical applications of shoeless movement for older adults. We will blend research with foot hygiene, muscular anatomy, and stability and mobility movements to train the foot and lower-leg complex to improve balance and foot function. To access this post, you must purchase OnDemand Monthly Subscription Payment Plan, OnDemand Annual Subscription, OnDemand Month-to-Month Subscription, SCW Premium Membership: 1 Year, SCW Premium Membership: 2 Years, OnDemand 6-Month Subscription, OnDemand 2 Year Subscription or Body & Sole: Barefoot Training for Active Agers.